“Dear consumers, after more than 25 years in the United Kingdom, we are about to close down…” This is how Yves Rocher’s British website announces its next closure, on March 14, 2019, 15 days before the Brexit date. Without explicitly mentioning the exit of the United Kingdom from the European Union, the message states that “the economic context does not allow the Yves Rocher brnd to continue trading in the UK anymore”. The L’Occitane Group is the latest beauty giant to double down on sustainability by incorporating recycled plastic into its product packaging. The company has joined forces with the sustainable plastic innovator Loop Industries on the initiative. The duo have entered a multi-year partnership that will see L’Occitane en Provence start to incorporate Loop PET plastic (which is 100% sustainable) into its product packaging as of the year 2022. The brand offers yet in-store recycling facilities at 30% of its retail locations - a figure it hopes to increase to 100% by the year 2025. L’Oréal has proven that it is getting serious about corporate sustainability, with its latest accolade. The beauty giant has been awarded a place on the ‘A List’ from non-profit environmental body CDP (Carbon Disclosure Project) for climate change, water security and forests. The organization scores around 6,800 companies annually in terms of the steps they are taking regarding climate change, deforestation and water security, rating them from A through to D minus. L’Oréal’s scoring makes it one of only two companies to have received A’s in all three categories this year, and the only company to have done so three years in a row. Last October, L’Oréal was one of more than 290 major brands that signed ‘The New Plastics Economy Global Commitment,’ led by the Ellen MacArthur Foundation in collaboration with UN Environment, which aims to reduce plastic waste via measures such as eliminating single-use plastic from supply chains and ensuring that 100 percent of plastic packaging can be easily and safely reused, recycled, or composted by 2025. Almost two years after launching its Find clothing brand, the giant Amazon is entering the make-up world with a make-up collection of the same name in the “top-of-the-range” segment. Make-up brands and collections have continued to increase in recent years. After the singers, actresses, models and influencers, it is now the turn of the giants of commerce and distribution to embark on this highly prized market niche. Amazon will be no exception as it announces today the launch of find, its new collection of high-end make-up. Like the eponymous fashion label, this new make-up line is aimed at everyone with a wide range of products, shades and textures, divided into four categories: lips, eyes, face and nails. The find. make-up collection is available exclusively on www.amazon.fr/findbeauty. Beauty giant L’Occitane International is adding the prestige skincare brand Elemis to its portfolio. The group, which owns multiple brands including L’Occitane en Provence, Melvita and Erborian, cited the British skincare brand’s “strong cross-generational consumer appeal” as one of the motivating factors behind the $900 million acquisition. Since it first broke onto the scene in 1990, Elemis has built up a reputation as a go-to luxury wellness brand for face and bodycare, focusing on the dual power of natural ingredients and scientific innovation. The London-based company is present in more than 1,600 spas, salons, stores and multiple e-retailers worldwide, and Elemis therapists treat over six and a half million clients per year. Have you ever wished that you could try on different hair color shades in the salon before committing to an expensive new look? Wella Professionals may have come up with a solution. 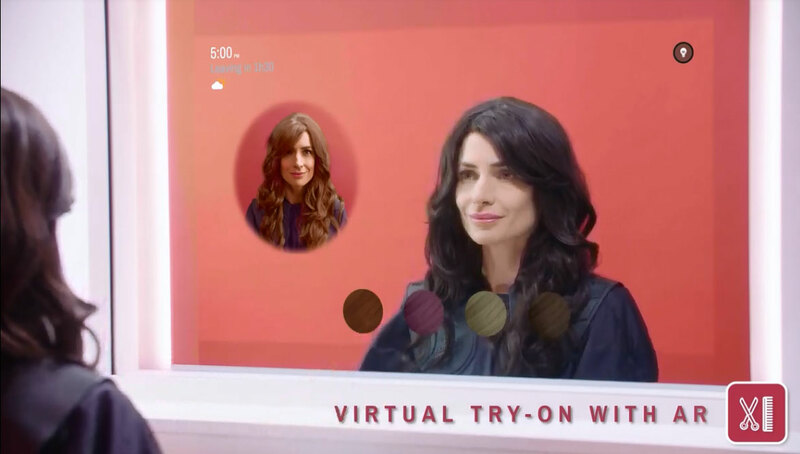 The Coty-owned beauty brand has unveiled a new augmented reality (AR) enabled ‘Smart Mirror’ at the Consumer Electronics Show (CES) 2019, which allows users to virtually test out different hair colors with live results. Powered by the existing CareOS operating system and incorporating Perfect Corp’s YouCamMakeup AR & AI technology, the mirror uses facial recognition technology to retrieve archived looks, and features a 360° video element to let clients view their hair from all angles. It also offers a series of trending and classic looks to inspire those who are unsure of what they want, and lets clients and stylists keep in touch via a connected app in between visits. The technology can be run on any connected device, ranging from a tablet to a mobile phone. The mirror, which is currently on show at CES 2019 as part of the CareOS Artémis connected Smart Mirror exhibit, was co-created with Wella Professionals hair stylists and salon owners. It came into being after a survey of almost 1,700 stylists and clients showed that customers are seeking more personalized in-salon consultations. AR has had an enormous impact on the beauty industry over the past few years, with multiple brands such as ModiFace and YouCam driving the increase in connected solutions and devices. Last November saw Modiface unveil a ‘Virtual Nail Salon’ app that lets users virtually test out 30 different nail polish shades, while YouCam and Eylure teamed up earlier in the year to test out an augmented reality (AR) makeup experience focusing on false eyelashes.